New York - Airports in New York City, Philadelphia and Baltimore were resuming very limited service Sunday, a day after a punishing blizzard dumped two feet or more of snow and brought transportation to a standstill along the East Coast. Other airports along the track of Winter Storm Jonas were doing better, with near-normal service. The major airlines intended to resume service at all airports throughout the region by Monday, though about 700 flights have been canceled for then. Along with clearing snow and ice from their own facilities and equipment, airlines and train operators were dealing with how to get all their snowbound employees to work. Amtrak was operating Sunday on all its routes, but with a reduced number of trains. Spokesman Marc Magliari said Sunday afternoon that the number of passengers was down from usual, but appeared to include many travelers who couldn’t get around on other transportation modes. “We’re seeing a pretty solid increase in ridership as the day has gone on,” he said. Amtrak had not yet determined whether it would be back to normal operations on Monday, as it is still coordinating with commuter rail and bus lines to see how many Amtrak employees would be able to get to train stations and other work locations Monday. Nearly 12,000 flights were canceled from Friday through Monday as states from New England to North Carolina wrestled with the massive snow dump. All told, 3,458 flights scheduled for Sunday and 699 flights for Monday had been canceled, according to flight tracking service FlightAware. With 3,100 flights failing to take off Friday and 4,511 being grounded on Saturday, the total of flights grounded was 11,768 for the four-day period. Around 1,000 flights were delayed Sunday, FlightAware said. Passengers were being urged to check with their airline before heading to Eastern airports. Officials at Philadelphia International Airport, which got hit with an entire season’s worth of snowfall over two days, said they planned to “gradually” resume operations Sunday. Delta expected to begin accepting its first arrivals Sunday afternoon at its New York hubs, John F. Kennedy International Airport and LaGuardia, both of which got 30 inches of snow. By mid-afternoon, Delta anticipated near-full operation at both airports, though its Delta Connection regional operation has been canceled through the rest of Sunday. Delta said its teams began working before daybreak at both airports to de-ice aircraft and ground equipment and clear snow from ramp and terminal areas. “We had a number of employees stay at nearby hotels so they could be on hand first thing in the morning to begin the painstaking task of digging out,” Dan O’Brien, duty director in Delta’s Operations and Customer Center, said in a statement. On Monday, Delta expects to operate a full schedule throughout the mid-Atlantic and Northeast, with a few exceptions. It expects to fly its first inbound aircraft to Washington around 9 a.m. EST Monday. American Airlines reported Sunday that operations at 46 airports it serves had been affected by the snow dump. Early Sunday afternoon, a company spokesman said it planned to resume flights Monday at the three New York-area airports, as well as the three serving Washington, D.C. American said operations had resumed in Charlotte, North Carolina, and a limit number of flights in and out of Philadelphia would resume Sunday afternoon. However, it cautioned that resumption of airport operations in Philadelphia and the Washington and New York areas would depend on weather conditions at those airports and on public transit and roadways. Southwest Airlines said it was back to normal or near-normal service Sunday in most cities it serves, but wasn’t operating in Philadelphia, the New York area, Baltimore and Washington, D.C., and Richmond, Virginia. It tentatively planned to start up service there on Monday, when only 40 of its 3,600 flights systemwide were canceled. A United Airlines spokesman said it was starting “very limited operations” at its Newark, New Jersey, hub and other New York City metro airports Sunday afternoon. 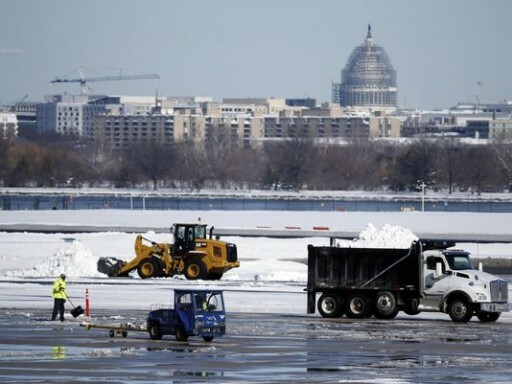 Operations were to resume gradually Monday afternoon at Dulles International Airport in Washington, as well as Baltimore and Philadelphia. All major airlines issued waivers for travel over the weekend, allowing passengers to rebook onto earlier or later flights to avoid the storms, without having to pay an extra charge. Passengers looking to cancel trips should wait until the airline officially calls off the flight. Airlines have been much more proactive in recent years about canceling flights, often doing so up to a day in advance. More travelers are affected, but they aren’t stuck waiting in airports. It also lets airlines restart the system quicker because they have planes and crews in place.